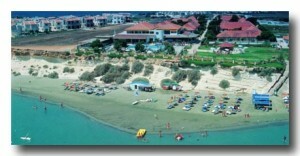 Pervolia is a small village located about 17 km from the center of larnaca. As a location, is an attractive holiday destination for every tourist, as it combines relaxation, multiple activities in the area as kitesurfing, cycling, windsurfing and a bunch of other sports. In the area you can find pubs and taverns with great food owned by the friendly locals. For a drink you can visit Stuck on Time bar, that is located at Pervolia square. At the bar you will find a big variety of cocktails and beer, pools and darts for entertainment and of course some great music. Also it has a projector and tv’s for football lovers. If you are hungry, Pervolia has a lot of traditional taverns and restaurants. For some traditional food you can visit Pyrgos and Kokos Tavern that their menu offers mezedes, souvlakia, seftalia, grill and fresh fish. If you prefer some other cuisine there is also Barcoast which has a variery of meats and other international cuisines.